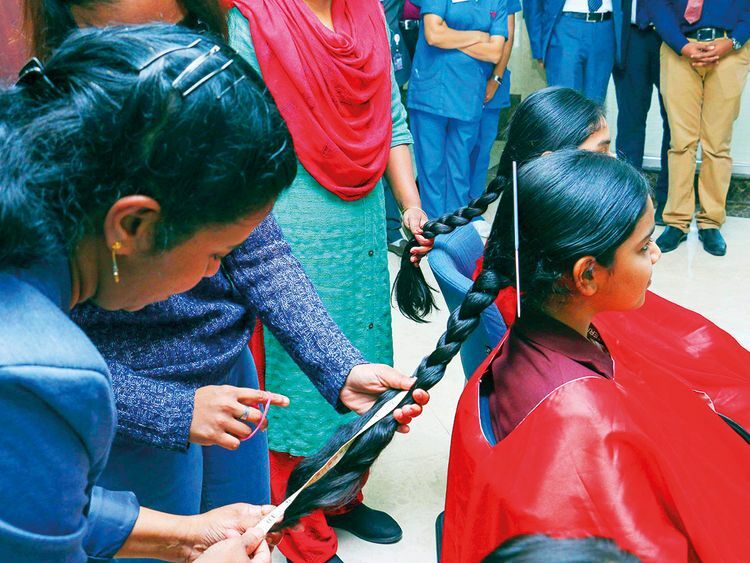 Dubai: Around 30 young girls on Tuesday donated their hair for wigs to be given to cancer patients. 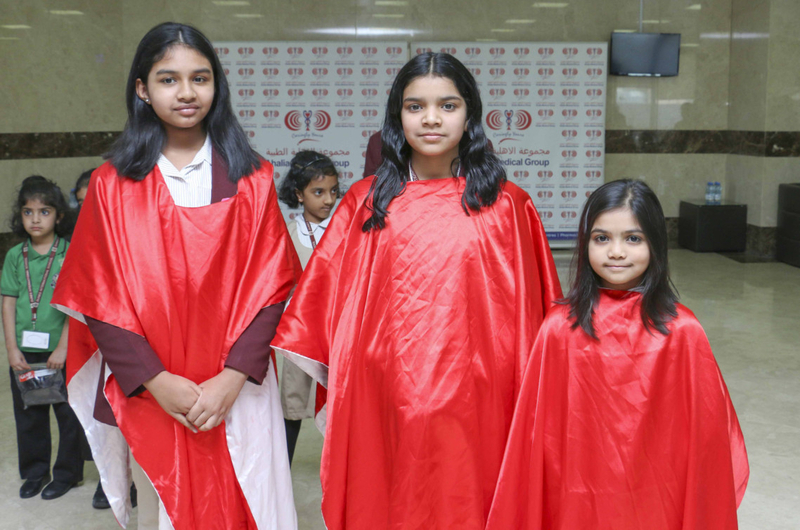 The girls donated at least 12 inches of their locks at Ahalia Hospital for the ‘Dunes-Hair for Hope’ arranged by Dunes International School, Abu Dhabi. 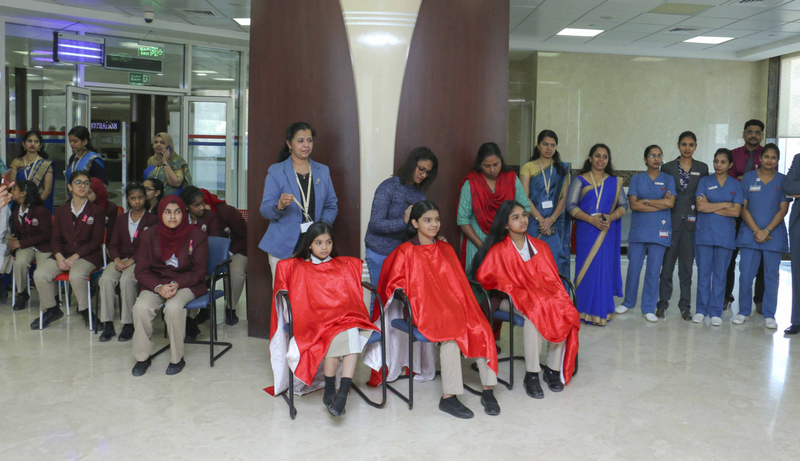 Paramjit Ahluwalia, the principal of Dunes International School, said the event was the first public hair donation event in Abu Dhabi and the second one in the UAE. “Synthetic wigs are available at cheaper prices, but they can cause harm on the scalp and also look unnatural. Wigs made out of natural hair are really expensive everywhere in the world. I feel this is the best way to help someone because we are healthy beings and we need to feel their pain too,” the principal said. School has organised a Hair for Hope Drive and the closing ceremony held as a Public Event. It was the first pubic event in Abu Dhabi and the second one in UAE. The girls exuberantly sported their short hair in turn after the donation. “When you cut your hair very short, people usually question why. So when they’d ask me, I’ll tell about this cause and thus raise awareness,” said Ameena, 12. “I am happy with Dunes Hair for Hope drive. I think one should help others in their own capacity and share happiness. As soon as I heard about it, I just knew I had to do it,” said 13-year-old Maryam Shamsudheen. The collected hair will be handed over to Friends of Cancer Patients, Sharjah with the cause supporter Prema Mathew, founder of ‘Hair for Hope-India, UAE’.